The second installment in Carmel Games Trapped series does not disappoint and is in some ways an improvement on mechanics of the first one. Several of the puzzles are more involved and may require a pencil and paper to help keep track of things. Clues also must be found before attempting the more complicated ones, preventing you from luckily guessing a solution or cheating too early! As per usual, you use the mouse to interact and point and click on things, along with combining items in your inventory at the bottom of the screen. See if you can get the treasure within 60 minutes before Captain Morgan comes for you, and try to walk out with fame and riches! Only issue I had was having to go outside of the game to google the image of the various flags.. to know what they were. Oh well, was simple enough.. took like 6 minutes to finish. You're back to try out another escape room. 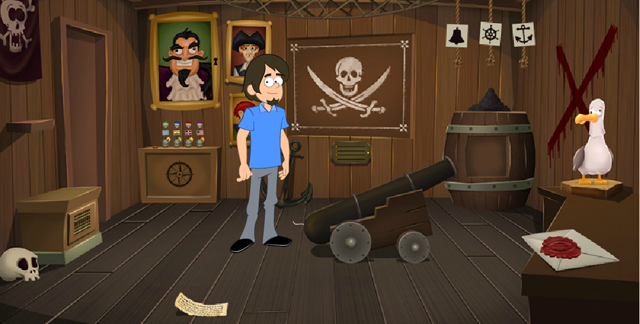 Puzzle your brains out for an hour (not likely) and you might just make off with Cap'n Morgan's cursed treasure! As in the previous game, the red timer on the ceiling ominously counts down the 60 minutes you have to get through the locked exit door on the left. To the left of that door, a red candle rests on a shelf, above a safe with a large grid of buttons that you can't solve yet. Looking at the paintings on the wall, you're particularly attracted to one large portrait with a keyhole on its frame. Below it, there's a puzzle with four drinks on a shelf, but it's too complicated to solve right now. Next to those, there's a control panel below the skull and cross-swords on the wall with a puzzle that has four sliders marked with letters and numbers. On the right side, three strings, each labeled with a different symbol, hang from the ceiling over a barrel with a pile of gunpowder. Pick up the paper note from the floor with some very verbose instructions, but missing an important half of its clue. Also on the floor, there's a (real) cannon pointed at a red X painted on the right wall. On the table in the far right, you can pick up a stamp next to a pelican figurine, and examine an envelope that needs to be "sent". Use the candle on the envelope and then the stamp. Looking closer at the wax seal, you find a clue with five symbols. Use the clue from the wax seal to solve the rope puzzle. Pull the ropes corresponding to the wheel, bell, bell, anchor, wheel (CLLRC). The barrel opens up so you can take a golden key. Use the key on the portrait frame, which swings open to let you take a world map from inside. The map has latitudes and longitudes drawn on, as well as a red X along the west coast of the North American continent. Use the clue from the map to solve the slider puzzle. The X on the map is at 60° North and 120° West. So click the N (first) slider twice and the W (last) slider 4 times, then hit the blinking button. The skull panel opens up, and Dread Pirate Roberts (actor?) greets you and hands you a clue for Captain Morgan's skull puzzle. Click on the skull puzzle (under the portraits), and you will automatically use the clue. Then solve the puzzle by swapping the skulls/flags/cups into the right positions. You can click each statement of the clue to turn it gray or black. Lines 1+6: Cup 1 has the American flag and lemonade. Lines 2+4: Cups 2 to 4 have the Indian, Micronesian and Dominican Republic flags. Line 5: Cup 4 has the green skull. Lines 3+8: the pear juice and blue skull are on the same pole, which must be Cup 3, and the purple skull is on Cup 1. Line 7: Cup 2 has the orange juice. By elimination, Cup 2 also has the red skull, and Cup 4 has the grape juice. Once you have the drinks properly set up, push the button to open the safe under the puzzle, and pick up a cannonball and half a note. Follow the clues from the note halves to unlock the grid safe. After making those buttons light up, the safe opens so you can take the box of matches from inside. Use the cannonball, gunpowder and then matches on the cannon. Boom! The wall is gone, and you escape with a coin from Morgan's treasure, and the curse that comes with it!